There's been a fire outbreak at the Federal Airport Authority (FAAN), headquarters in Lagos. PM News reports that the Director, Lagos State Fire Service, Razak Fadipe, disclosed that the state's fire service has arrived at the scene, with two fire trucks carrying 10,000 litres of water, and are currently battling to put out the inferno. the National Union of Air Transport Employees, NUATE, identified as Frank, said the Audit unit of FAAN was badly affected by the fire. 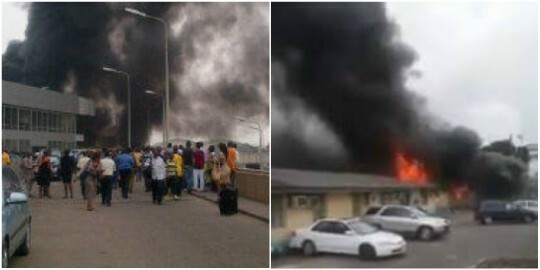 Reports on Twitter, revealed that that FAAN staff were forced to vacate the premises when the fire got out of hand. There are also reports that the huge fire has caused a traffic jam at terminal two of the Murtala Muhammed Airport.